Perfect Gifts for Kids that will get them in the kitchen with you! I’ll put my kitchen essentials first, and then I’ll have a section for gifts in the $10 range. 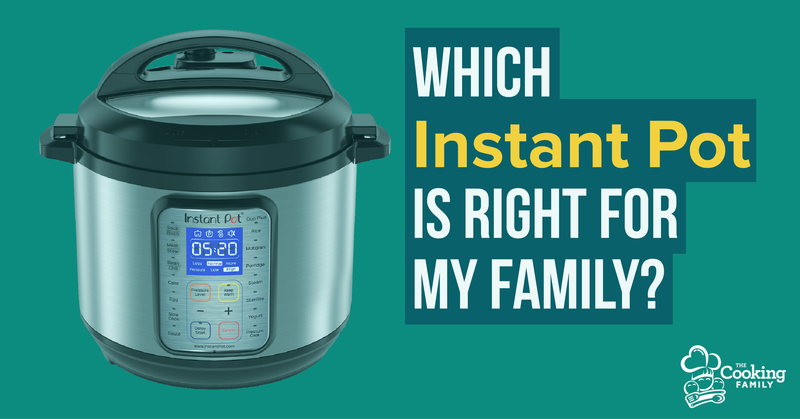 It doesn’t have to cost a fortune to have great tools in your kitchen! 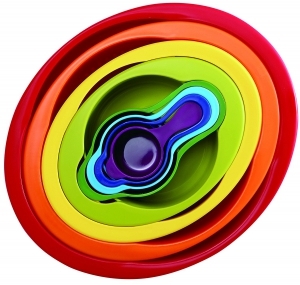 Fun wooden spoons– This set of five colorful tools is handy for a variety of tasks. Paring knife set – Great sizes for little hands, and useful for big ones also! 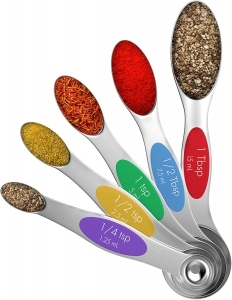 Magnetic Stainless Steel Measuring Spoons – These are so fun! They have two ends on them, round and narrow. The narrow end will fit down into small bottles of herbs and spices. Also, you can use one end for liquids and one for dry ingredients, so you don’t have to wash and dry after you add the vanilla and then need to put in baking powder. Best of all, they are held together by a magnet. This is helpful for children, because they can don’t have the rest of the bunch dangling around throwing things off balance while they transfer ingredients from the spice jar over to the pot. For bonus points, they are colorful and just fun! Medium Yellow (#20) Disher – Food Dishers are absolutely fabulous for helping kids scoop out food portions. This holds not quite 1/4 cup. We use it for scooping muffin batter into cupcake tins, serving mashed potatoes, putting latkes on the griddle, mini meatloaves in a muffin tin, and more. Small Orchid (#40) Disher – We use this smaller size scoop (which holds about 1.5 Tablespoons) for cookie dough, meatballs, and salmon patties. This brand, Zeroll, is very good, high-quality and easy for kids to use. However, this disher/cookie scoop is a less-expensive option. Nesting Bowl and Cup Set – Features 2 mixing bowls, a colander, a mesh strainer, and 4 measuring cups. These tools are all things we use often, so this is a cost-efficient way of acquiring several helpful items at once, plus they store all nestled cozily together in a small amount of space. 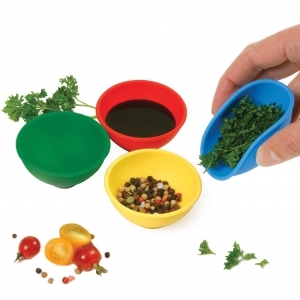 Mixing Bowls – These have non-skid bottoms and a handle and pour spout. All fabulous for children. Digital Kitchen Scale – This kitchen scale is used many times each day in our house by both children and adults alike. It simplifies measuring so much! This particular scale is great because it has a tare weight function where you can zero out the weight of the bowl and/or previously added ingredients and just measure what you are currently adding. It also converts from grams to ounces to pounds and ounces. I love that it is available in several colors! 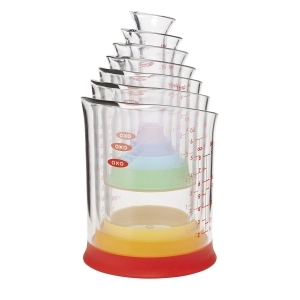 Nesting Measuring Beakers – These handy little measuring beakers are fantastic for kids measuring small amounts of liquids for recipes. They have a wide base so they don’t tip over and clear markings for measuring accurately. Also, they are lightweight and don’t break when dropped on the floor. They even nest together for compact storage too! This 7-piece set ranges from a tiny one that measures a teaspoon, all the way up to one cup. KitchenAid Flex Edge Beater – This scraping paddle for the KitchenAid tilt-head stand mixer is a great gift for someone who loves to mix and bake with the KitchenAid mixer. I LOVE mine!! KitchenAid Silicon Spatula Set at a fantastic price! This beautiful Berard olive-wood spoon is a high quality at a great price point. It has a flat edge for breaking up foods like ground meat and reaches into the corners of the pot to keep foods from sticking there. This is a 4-piece version of the Nesting Beakers I mentioned earlier. 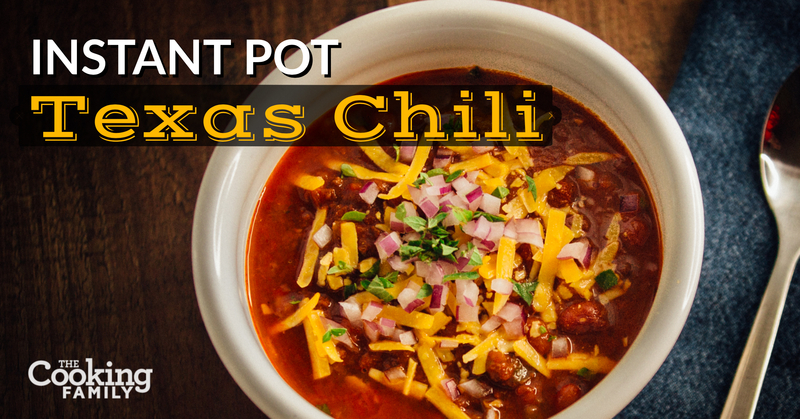 It measures from 1 teaspoon up to 4 Tablespoons (1/4 cup). Pinch bowls are really handy for setting up ingredients ahead of time. They’re just the right size for small hands, too. Two color schemes available: Primary or Modern. Flexible plastic cutting mats are great as extra cutting boards for when you have multiple jobs going on at the same time. Then you can pick up the board, roll it into a U-shape, and use it as a funnel to help get ingredients into the pot neatly. Small Santoku Knife (5″) is a great starter knife for kids, good for chopping vegetables like peppers and onions. If you’re getting a knife, you should definitely consider a cut resistant glove. It will greatly reduce the anxiety that comes while kids are learning to safely handle sharp instruments, like knives, peelers, and graters. We even use them for the adults in the kitchen. Here’s a kid-sized cut resistant glove. And here’s an adult-sized model. This Y-shaped vegetable peeler can be a great alternative to traditional peelers, and my lefty child prefers using this style of peeler. 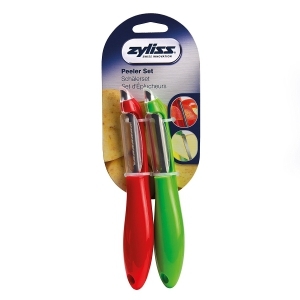 Tomato and Fruit Peeler – Good for peeling…tomatoes…and, um…fruit. I don’t really feel like I can improve upon their description here. Vegetable Peeler for carrots, potatoes, zucchini, etc. Manual Can Opener – Helping to open cans of tomatoes and beans is a great job for young kids. We prefer this manual model. It’s cheaper in price, it is good for kids’ dexterity, and it works even when there’s a power outage or you have no batteries. My 6-year olds have all used this. So there you go, happy shopping! I hope you find some good ideas that help you cross some names off your list, as well as create opportunities to get your kids joining you in the kitchen! Merry Christmas from The Cooking Family!